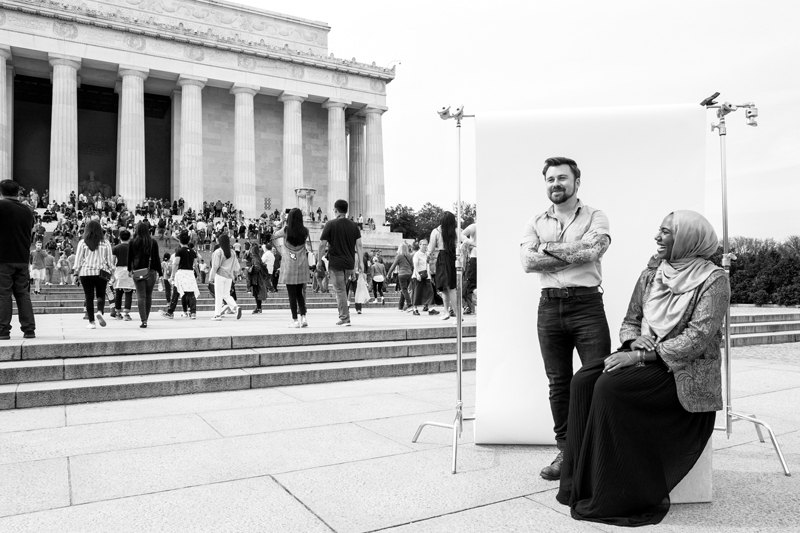 Veteran Joe Jenkins and refugee Remaz Abdelgader pose for a photo as part of the #WhatIFoughtFor exhibit. Image courtesy photographer Tanika Roy. 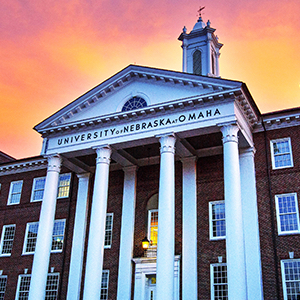 The University of Nebraska at Omaha (UNO) will host a panel discussion and photo exhibit highlighting the stories of veterans and how their lives are intertwined with those of refugees as part of its Veterans Day programming this year. The free public event – titled #WhatIFoughtFor – is set for Monday, Nov. 12 from 6:30 to 8:30 P.M. at the Thompson Alumni Center. Tickets can be claimed via Eventbrite. The exhibit features portrait photography of refugees and veterans who share a personal relationship. The images are part of a multimedia storytelling project about the Special Immigrant Visa (SIV) program for interpreters and translators who served with the U.S. military. This UNO event will mark the first time the exhibit has been shown outside the nation’s capital. The panel discussion will include the following participants. Rick Burns is an Army veteran of Iraq and Afghanistan and the founder of Karadah Project International, a nonprofit supporting peace, stability, and humanitarian efforts in those countries. Burns is a member of the Council Bluffs Iowa Sister Cities Association board of directors and serves as the Sister Cities International Afghanistan Country Representative. He is co-founder of the Nebraska-Iowa chapter of Veterans for American Ideals and involved with other military and civic service organizations. Sharon Robino-West served four years in the United States Marine Corps as a communicator in an artillery unit. She has a MA in Leadership and Organizational Change, is certified by the state of Nebraska and the Vets4Vets organization in peer support and has numerous other mental health certifications and trainings, including Trauma Informed Care and Suicide Survivor Support Group Facilitation through the American Foundation for Suicide Prevention. Robino-West’s passion is serving the underserved through her love of writing and photography. She has been a member of Nebraska Warrior Writers since its inception in 2014 as well as a member of the Writers Guild initiative in NYC since 2011. She is co-founder of the Nebraska-Iowa chapter of Veterans for American Ideals. Emily Lindsey is a commissioned Marine officer who served as platoon commander, executive officer and assistant squadron operations officer. She is currently a Starbucks district manager, managing a portfolio of fourteen stores. She facilitated the dedication of the Papillion location as a Military Family Store in February 2018. Lindsey serves on The Armed Forces Network, a regional task force created to fulfill Starbuck’s commitment to hire 25,000 veterans and spouses by 2020 and to provide local advocacy services. For her work as a military and refugee advocate and opportunity youth mentor, Lindsey has twice received the Spirit of Starbucks Award, which is given to those who exhibit a significant achievement utilizing the principles of Starbucks’s mission. Mariam Adams, a native of Iraq, served as an interpreter for the 422 Civil Affairs Battalion and the 1st Cavalry Division in Baghdad. Adams’ support of the US mission put her and her family in increasing danger. She came to the United States as a refugee under the Special Immigrant Visa program and with the help of two Army officers with whom she worked in Iraq. Beginning in 2015 Adams has worked with other local refugees through the Omaha Refugee Empowerment Center, a nonprofit organization founded by refugees to assist in the resettlement process. Shafiq Jahish served eight years as an interpreter for the US military and State Department in his home country of Afghanistan. His support of the US mission there made him and his family the target of multiple death threats. After a four year process, Jahish and his family were granted admission to the United States through the Special Immigrant Visa program. He now works for Lutheran Family Services as Global Language Solutions program supervisor and is working toward a degree in Management Information Systems at UNO. The event is a collaboration between the UNO College of Arts and Sciences, Lutheran Family Services and Veterans for American Ideals. Veterans for American Ideals is a project of Human Rights First. Artist Tanika Roy, a U.S. Marine Corps veteran, photographed each image included in the #WhatIFoughtFor exhibit. More information is available at whatifoughtfor.vfai.org.